As regular blog readers know, I am currently on a research leave for the year. A good part of my leave has been spent in Wooster, but I believe it is important to spend a significant time outside of Wooster as well in order to get fresh ideas and perspectives to inform my research and ultimately my mentoring and teaching of students. To get to Science Park, just follow the bike path. So, as part of this time outside Wooster exploring new ideas, I spent the last half of March in Amsterdam, the capital of the Netherlands! I had not been to the Netherlands before, so this was a completely new experience for me. This trip was focused on getting a broader perspective on our beadpile research project. Specifically, I wanted to learn more about the field of soft matter, a branch of condensed matter which is not standard solid state physics. Granular materials like the bead pile fall under the broader area of soft matter. Several years ago at the March Meeting, I met Dmitry Denisov, who had been a post-doc with Rinke Wijngaarden and was then a postdoc with Peter Schall. Wijngaarden and his group were responsible for some really lovely papers about avalanches in piles of rice (and some other grains) in a quite different geometry than our conical pile of beads. At this meeting, Denisov was presenting some quite impressive work from Schall’s group with shear on a 3-d collection of beads, submerged in an index-matched fluid and imaged through the depth of the pile by using a laser sheet to illuminate the beads one slice at a time. Shortly after this meeting, I decided to create an opportunity to visit these groups! 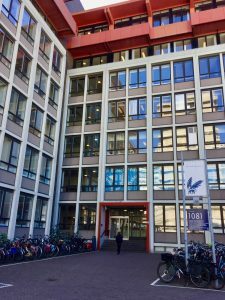 Fortunately, Peter Schall was very happy to host me in the Soft Matter group at the University of Amsterdam for a brief visit. I have to say that this is one of the things that I appreciate so much about physics — at least in the research areas that I am active in, researchers are so open to having guests visit. The open exchange of ideas is really in practice. I know there are more competitive areas of physics, but in my experience, scientists are almost always happy to talk to me about their results and discuss what I am doing. It is all too easy to take for granted how unusual and how different from a business environment this openness is. 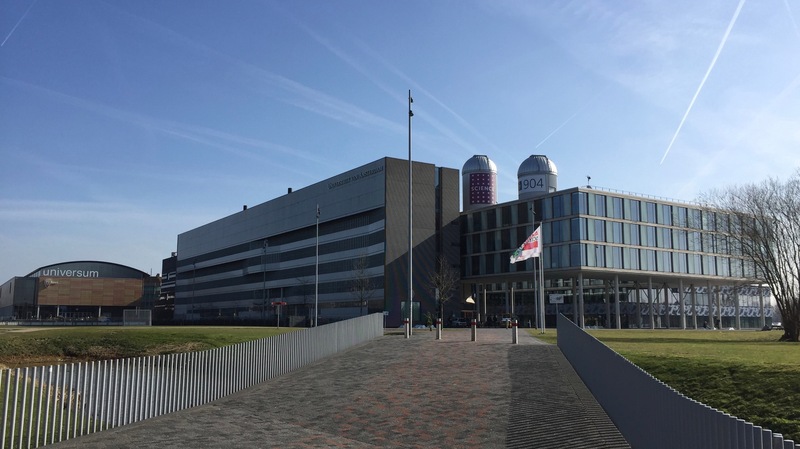 All of the science departments at the University of Amsterdam (UvA) have recently moved farther from the central city to a new area known as Science Park. Science Park hosts a number of research institutes and start-up space in addition to the entire science faculty from the UvA. 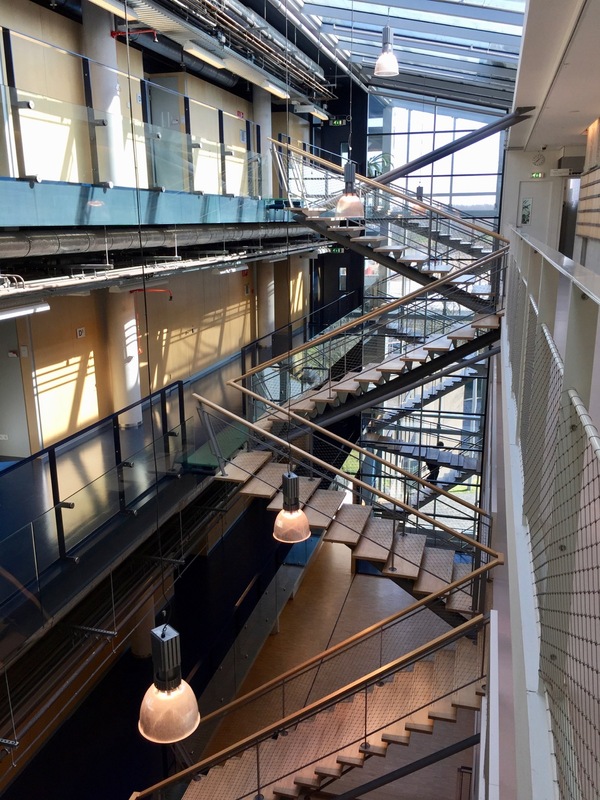 The faculty from the UvA are in building 904, a massive building which houses all types of sciences, and an attached but decoupled building to house all of the labs. The design is intended to allow more collaboration between different scientific disciplines, and this intent does seem to be working. 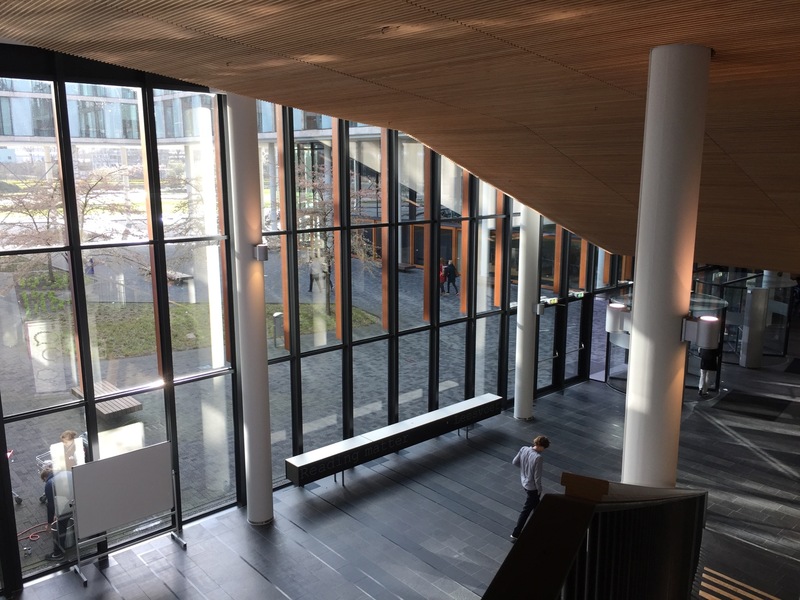 Overall, like most modern buildings I’ve visited in Europe, there was a great deal of natural light. And, of course, communal space with coffee machines and tea kitchens so that those working there can get together for coffee and tea breaks, or eat lunch together. This aspect is something I miss in the U.S. — I keep thinking that I should start a regular coffee and cake time, but it hasn’t seemed to work out. During my visit, I spent a very productive morning talking to Dmitry Denisov comparing the rice pile results to my bead pile results. And I talked to most of the graduate students about their different projects and toured the labs, which is always the best part for me as an experimentalist. I was really struck by the variety of things that they are working on, and also by the number of ways that the Casimir effect can come into play. Since I previously only remembered the name of the Casimir effect and not the actual effect, this was good information for me to learn! 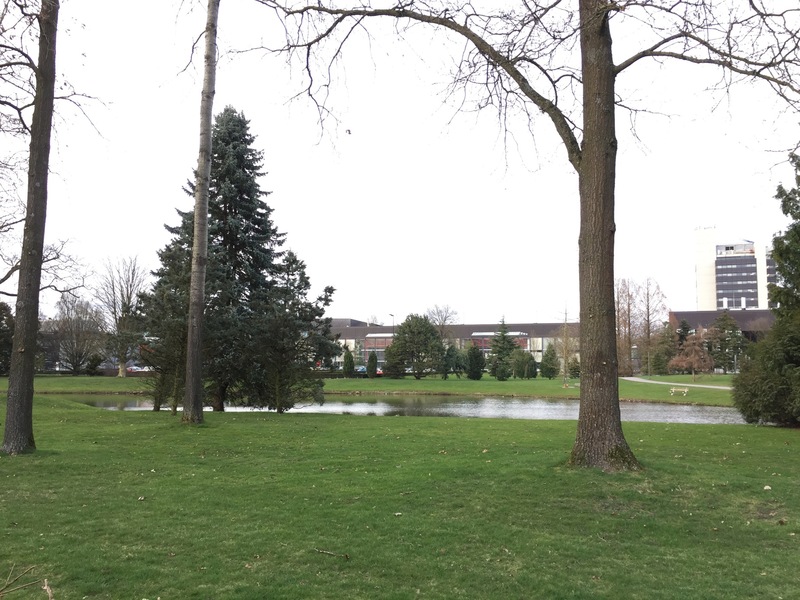 The transition from the lab building (on the left) to the office building (on the right). 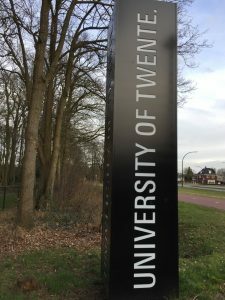 In addition to visiting the University of Amsterdam, I traveled all the way across the country to the University of Twente! 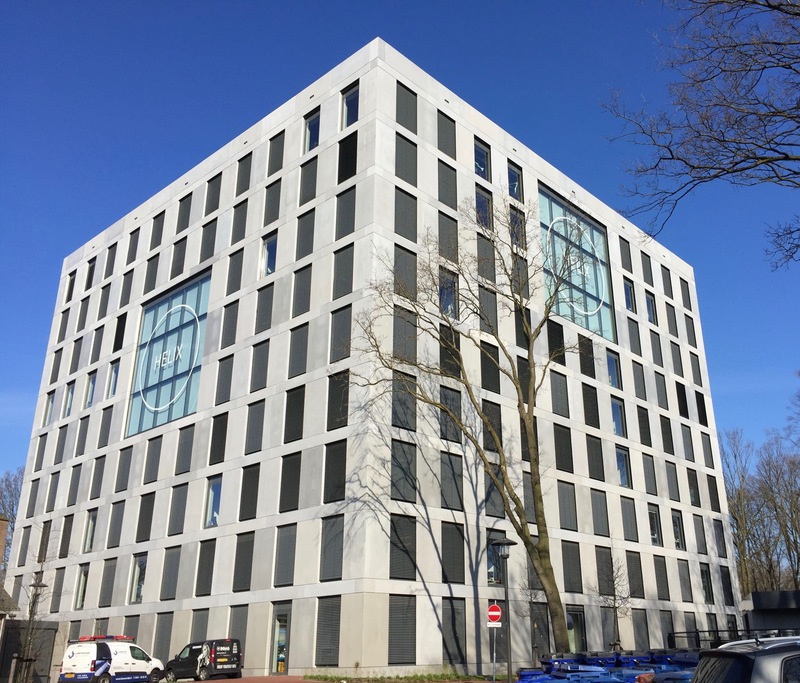 Located in Enschede, it’s only a few kilometers from the border with Germany, and it took me about two hours door to door from my rental apartment in Amsterdam. 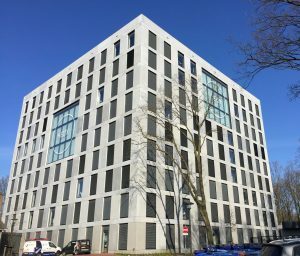 There are quite a number of researchers working on soft matter in the Netherlands, so I wanted to visit as many as possible. In Twente, I got to learn quite a bit more than I knew about non-Newtonian fluids (like the famous oobleck mixture of cornstarch and water) and also talked for a long time about craters and avalanches resulting from drops of liquid impacting a granular base. 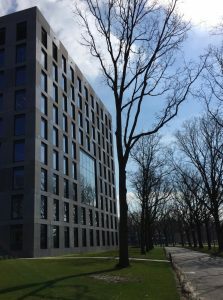 Besides visiting Twente, I also visited the University of Wageningen. 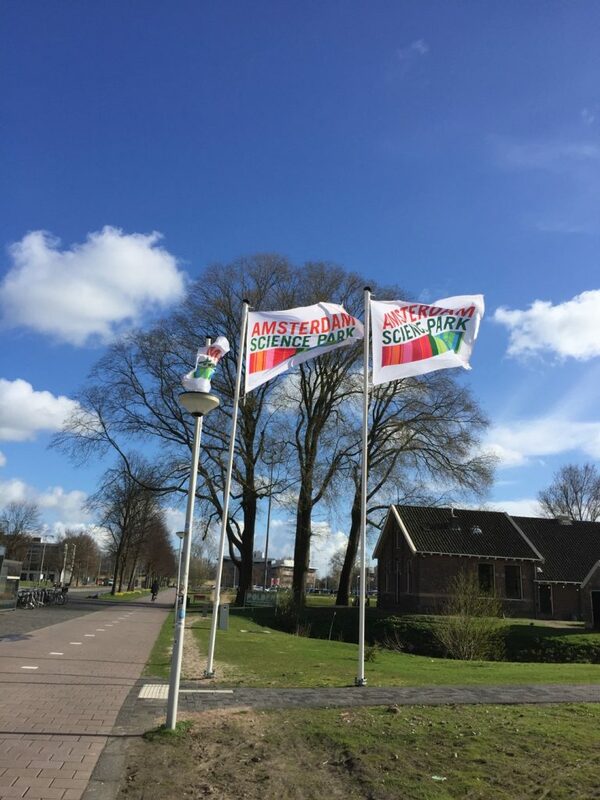 Wageningen and Twente are both much newer universities than UvA. 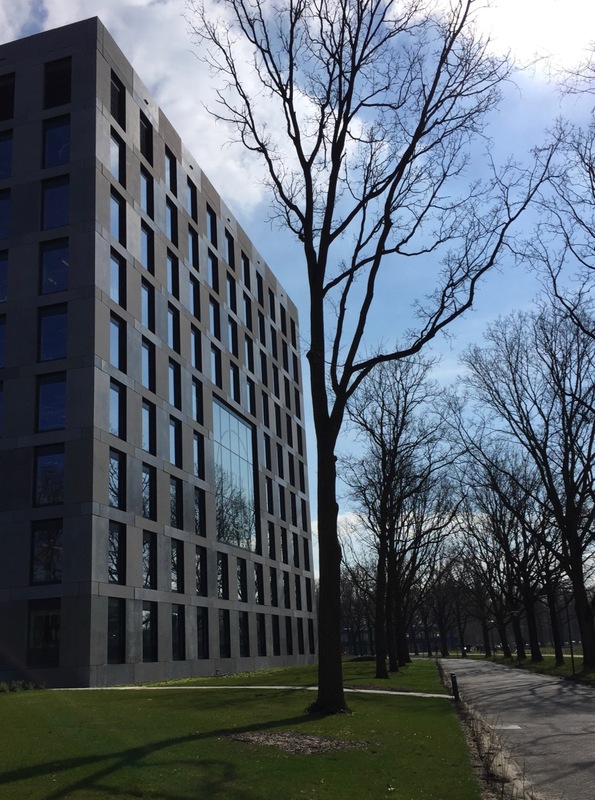 Wageningen has been building rapidly in the last 10 or 20 years, and its campus is very modern. One thing I really liked as a visitor was that the name of each building was incorporated into the building itself, so that you could tell from a huge distance away which building is which. Another view of the Helix building, just because I like the picture with the reflections in the windows. The brightness of the sun may make it a little difficult to read in the small photo (click for full size!) but in person, you could see HELIX from quite a distance. And, inside, the space inside the HELIX-marked windows was a three-story atrium with public spaces and of course, coffee and tea kitchens. 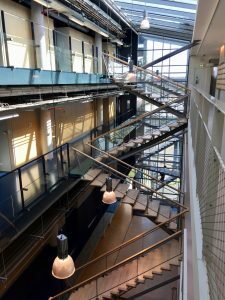 Wageningen is organized rather differently than a typical university, which I found interesting. It is focused on life sciences and the environment, and so the physicists there are working on things related to those areas. Overall, very interesting. And when I saw the room of 10 confocal microscopes just waiting to be used, I nearly swooned. I don’t use confocal microscopes yet, but I know what they cost, and if I had access to a room full of 10 of them, I’d figure out something to do with them! De Boelelaan 1081 at the VU. 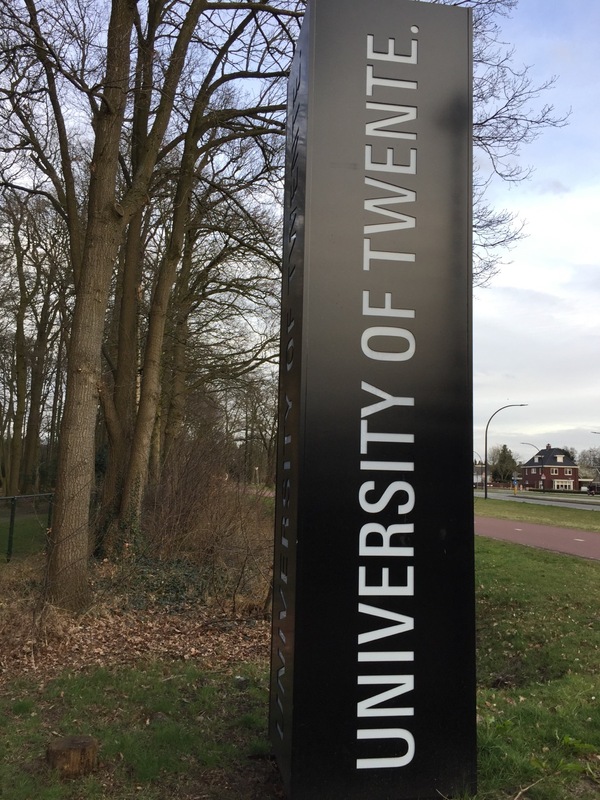 Note the cool griffin on the sign — the griffin is the university’s emblem, and its wings form a V.
Finally, near the end of my visit, came my meeting with Rinke Wijngaarden at the Vrije Universiteit Amsterdam, or the VU. 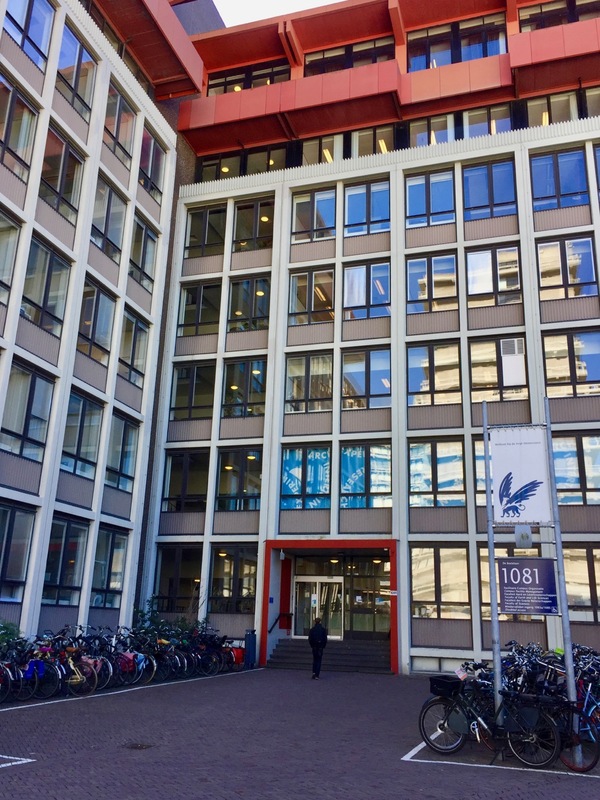 The VU was founded in 1880 — the fact that it is Vrije or “free” means that it was not controlled by the church or the state, so that it was free to pursue knowledge in the general interest of society. 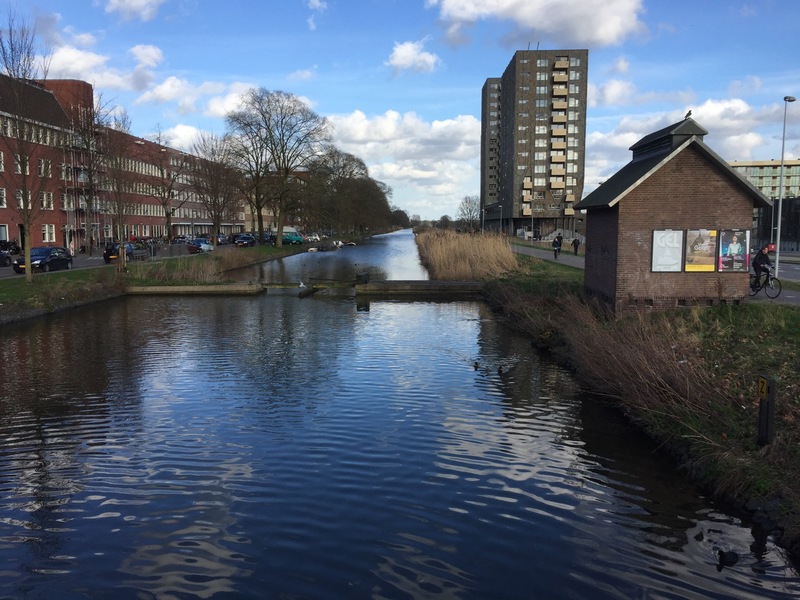 Professor Wijngaarden has changed research areas and no longer works in granular material, but we had a very productive discussion about some of his results in rice, and how his findings might relate to our beadpile experiment. There are a number of differences in the behavior of our spherical beads and their rice grains, and there are also a number of things about the system that they were easily able to measure that we have a hard time measuring, because of the difference in our pile geometries. Overall, the discussions with Wijngaarden and with Dmitry Denisov about the bead pile and rice pile were absolutely the scientific highlights of the trip. I came away with many new ideas about tracking the pile and analyzing the data. Very exciting! This post is already rather long, so I will have to make another post with more of the tourist-type activities and photos. I know you need to see some tulips (I did! ), so that will come shortly. But in the meanwhile, here is a lovely canal and windmill for your viewing pleasure. 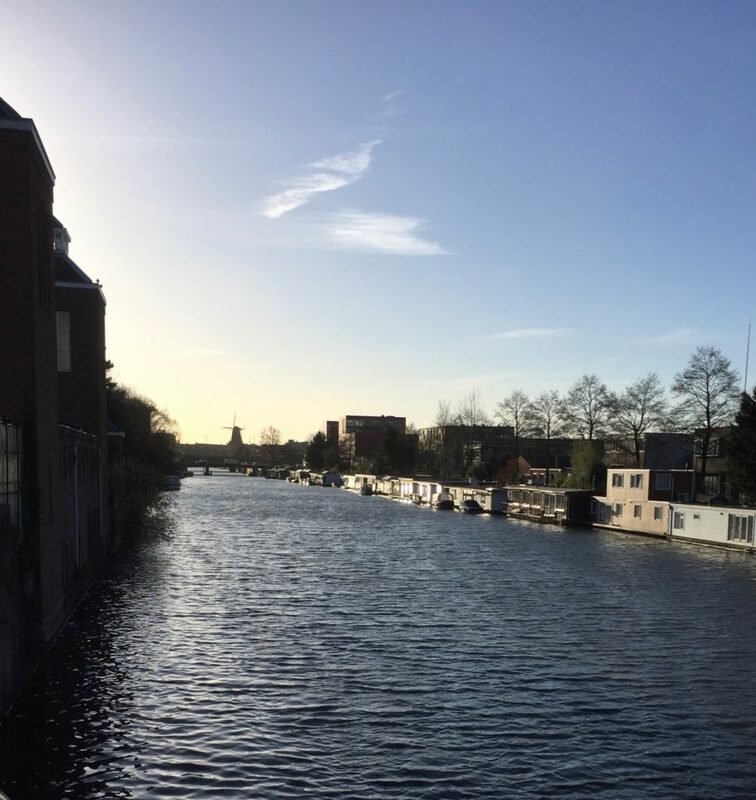 Just another walk home from Science Park, with beautiful light on the canal and a windmill in the distance. This entry was posted in Physics, Travel. Bookmark the permalink.